andrews23 wrote: Unfortunately, ImageShack will be eventually charging money to upload pictures. How do I post general messages such as posting when I got a success? 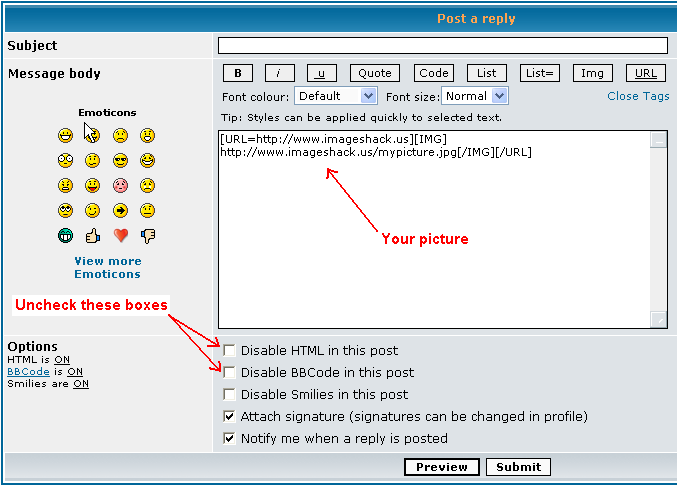 lovetowrite wrote: How do I post general messages such as posting when I got a success? Hey, question. I know how to upload with SurfmyPictures, but how do I just place a picture on the post? A lot of people don't use a link; part of their post is the picture. When I post on surfmypicyures I hit upload and it just takes me to a blank page. What am I doing wrong? thor_rider_0001 wrote: When I post on surfmypicyures I hit upload and it just takes me to a blank page. What am I doing wrong? When I first began using SurfmyPictures, the exact thing happened to me. Later on, I found out that I need to select a picture size and resize my photo to match the size, then upload it. So, in other words, I choose (not click on, but decide) one of the photo sizes, open one of my pictures on my computer, resize it to match the photo size, save, click on the photo size, and upload.